Maldivian blogger and activist Yameen Rasheed, 29, was stabbed to death in the country's capital Male in the early morning hours of April 23, 2017. Through his blog The Daily Panic and Twitter account @Yaamyn, Rasheed had become known as an outspoken critic of the government and radical Islamism. Shocked by this death, Maldivians expressed their grief and concerns on social media, while some demanded an international probe. Rasheed was found in the stairwell of his apartment at 3 a.m. with multiple stab wounds and died soon after he was taken to the hospital. He suffered 16 stab wounds to his body, including 14 on the chest, one on the neck and one on the head. He had received several death threats via text messages and social media for his views against the government and religious extremists, which he had reported to the police. Besides his online writings, Rasheed was an activist. On May 1, 2015, he was arrested with dozens of other activists for being part of anti-government protests and was held in custody for 21 days. Rasheed was working for the Maldives Stock Exchange as an IT professional. In honor of Rasheed, the Stock Exchange office was closed on April 23. The spokesperson of President Abdulla Yameen tweeted that the government “will deliver justice”. The public are also urged to provide information in order to help solve the case. Deeply shocked by the killing of social media activist Yameen Rasheed. May Allah bless his soul! His murderers must be bought to justice. A brave voice, brutally silenced. Only an impartial & open investigation with international participation can provide justice for @yaamyn. We will never forget you.. 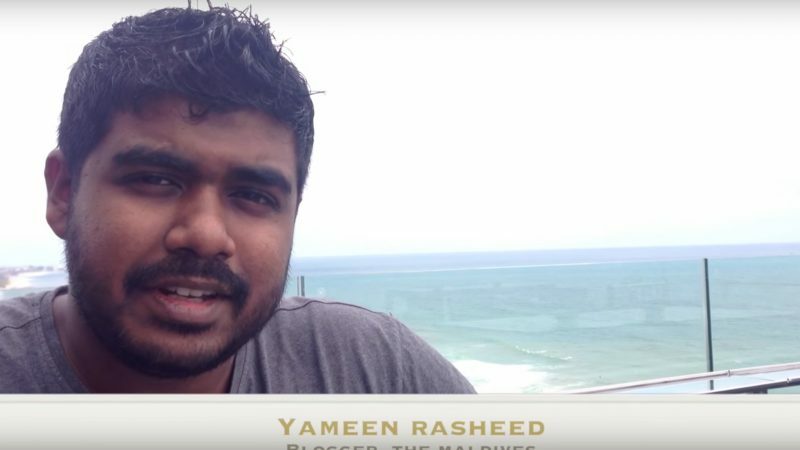 Anyone who would like to know more about Yameen Rasheed and the kind of human being that he was, you can watch the web video series (This week in Maldives) we were doing together. We were only able to record a few episodes when we were forced to stop the series fearing for his safety as I have been based overseas for the last 5 years. Maldives has a troubling history of extrajudicial killings targeting journalists, activists, and bloggers. Blogger, LGBT activist and journalist Ismail Khilath Rasheed, also known as Hilath, was stabbed in June 2012 by radical Islamists. Quite similar to Rasheed's murder, Dr Afrasheem Ali, a member of parliament of the Progressive Party of the Maldives (PPM), was brutally stabbed to death outside his home in October 2012. Rasheed was a close friend of Ahmed Rilwan Abdulla, another well-known Maldivian journalist, blogger and human rights advocate, who was abducted and disappeared in 2014 (see Global Voices report). Since 2014, Rasheed had been pushing hard to get justice for Rilwan, and was recently working with Rilwan’s family to file a case against the Maldives police related to the investigation into Rilwan's death. This cannot be an isolated incident of a lunatic running around killing people. I feel very strongly that this had been planned and executed. Cannot trust people at Maldives Police Service who turned a blind eye to death threats against Yameen Rasheed to conduct an impartial investigation into his death. “So called” Paradise on Earth has no public safety for it's citizens. Tomorrow, it could be me, you, or any of us. Those who slaughtered Afrasheem, abducted Rilwan, murdered Yameen; know that your attempts to silence, intimidate us will create more of us. How many Rilwans and Yameen's has to die for you before you start fight for dignified life?